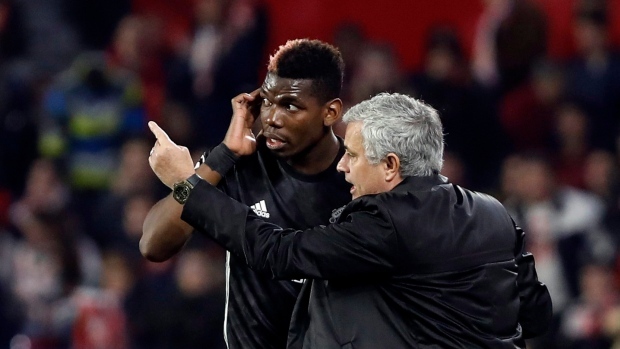 Manchester United manager Jose Mourinho gave a furious dressing down of midfielder Paul Pogba in the locker room following the club's 2-2 draw with Southampton on Saturday, reports The Daily Record's Duncan Castles, calling the France international "a virus." “You don't play," Mourinho reportedly said. "You don't respect players and supporters. And you kill the mentality of the good honest people around you." The World Cup winner was statistically poor in Saturday's match, getting dispossessed on eight occasions and losing half of his 30 duels. Without naming Pogba, Mourinho hit out at his midfield in his postgame remarks. "The second goal was a direct free-kick and the first goal was because we don't press enough the ball when our block is low, which is something that we do wrong," Mourinho said. "Doesn't matter the system we play, has to do with the characteristics of the players. We don't have many – with all the respect, hope people understand what I mean – we don't have many 'mad dogs'. The ones that bite the ball all the time and press all the time, we don't have many people with that spirit so nothing to do with the system." While United has qualified for the knockout stage of the Champions League, their domestic campaign has been poor. The team currently sits seventh in the table and is eight points adrift of Arsenal for the final Champions League place. Most concerning for a United team filled with high-priced attacking talent is that they have conceded more goals (23) than they have scored (22). The Red Devils are next in action on Saturday when they host Fulham at Old Trafford.